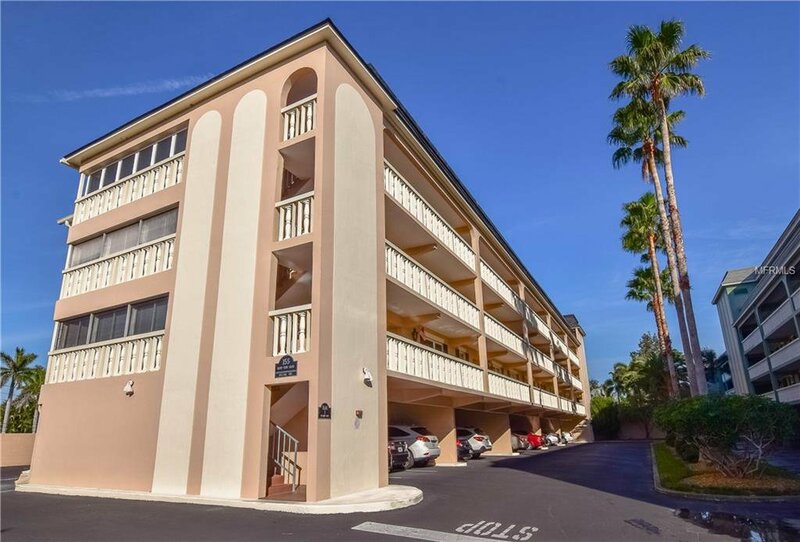 FABULOUS 2 BED/2 BATH BELLEAIR BLUFFS CONDO IN THE LOVELY PORT BELLEAIR COMMUNITY. Port Belleair is a well maintained 55+ community just east of the Belleair Bridge & Intracoastal Waterway. This home has been updated with new carpet, waterproof laminate flooring, and fresh paint throughout. Enjoy a well- appointed kitchen featuring NEW APPLIANCES AND NEW CABINETRY WITH CHIC AND MODERN HARDWARE. The open floor plan includes a combo living/dining area with beautiful details like wainscoting in the dining area and neutral tones on the walls and floors. There’s a cozy Florida room that’s perfect for your morning newspaper and coffee as well. The master suite has a spacious closet, offers lots of natural light, and features an UPDATED MASTER BATH with walk in shower. The 2nd bedroom is ample size with another large closet and hall bath that offers a tub and shower. You’ll also find a PRIVATE STORAGE ROOM, INTERIOR LAUNDRY, ELEVATOR TO UNIT, DEDICATED UNDER BLDG PARKING SPOT, AND PLENTY OF GUEST PARKING. Community amenities include a spacious clubhouse, a fabulous heated pool, and outdoor grill area. This is a great opportunity for full time residents or the perfect winter retreat for our out-of-state friends. THIS PROPERTY IS CONVENIENTLY LOCATED MINUTES FROM THE STUNNING GULF BEACHES, SHOPPING AND SUPERB RESTAURANTS. Come see this one today! Listing courtesy of KELLER WILLIAMS RLTY SEMINOLE. Selling Office: FLORIDA LUXURY REALTY, INC.